NORTH VANCOUVER, B.C. - A North Vancouver company that won a federal shipbuilding contract two years ago is going to get even busier after being awarded a contract to build up to 10 more non-combat ships for the Canadian Coast Guard, the government announced Monday. The $3.3-billion project is in addition to the seven non-combat vessels that Seaspan Shipyards is already slated to build after being awarded an $8-billion deal by the federal shipbuilding procurement project in October 2011. Federal Public Works Minister Diane Finley, who made the announcement at the North Vancouver shipyard on Monday, called the now $38-billion procurement project an "unprecedented investment" by the government. She said the project will see the shipping industry generate $2 billion a year in economic benefits for Canadians. "By economic benefits, what I really mean is good, skilled jobs, and even better ... it is at last bringing some long-term stability to this industry," she told a crowd gathered at the Seaspan's North Vancouver's shipyard. "Those boom-and-bust cycles that have long plagued the Canadian shipbuilding industry are already becoming a thing of the past." Finley added that the industry is expected to generate more than 15,000 jobs over the next 30 years, including jobs in steel manufacturing, information technology and defence systems. As part of the $3.3-billion project, Seaspan will construct up to five so-called medium-endurance vessels that are about 65 metres in length. They will be used for various coast guard programs such as the deployment, recovery and maintenance of aids to navigation, Finley said. Up to another five offshore patrol ships will also be built for fisheries protection, search and rescue and environmental response. 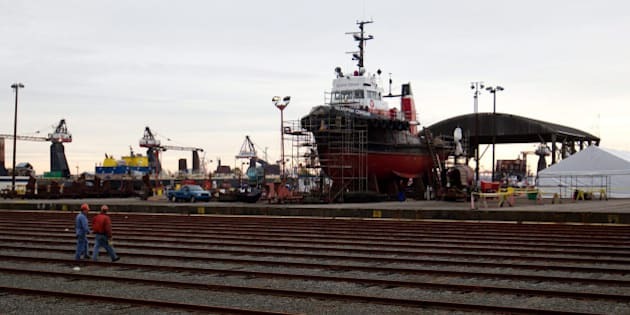 The North Vancouver shipyard is already preparing to build other non-combat vessels for the Coast Guard, including a polar icebreaker, an offshore oceanographic science vessel, and offshore fisheries science vessels. Seaspan President Brian Carter said the company is currently undergoing a $200-million infrastructure upgrade, and construction of the first offshore fisheries science vessel will begin next October. "In our shipyard office, about 70 men and women are working hard to complete the engineering, procurement, detail, design and planning for the first ship that will be built under the (shipbuilding) program," he said. Carter said he expects his current workforce to expand to a thousand people over the next few years. Irving Shipyard in Halifax was also awarded a $25-billion contract in 2011 to build 21 combat vessels. Like Seaspan, the Halifax shipyard is also undergoing renovations to prepare for ship construction. The federal shipbuilding project includes some smaller vessels that Finley says will be completed separately.